This extraordinary crucifixion scene shows a wonderfully carved figure of Jesus hanging on the cross with 4 uniquely carved sentries standing guard. The bases is built with cross pieces of wood making 6 arms or extensions. On the fours arms of the base that go toward the corners of the bottle are mounted 4 guards. The guards are all identical and are carved in a very narrow and unique way. Each have distinctive facial features painted on in black. They have black hair, shoes and ring around the ankles. They each have a long spear, with a red painted tip, that rests against the soldier's shoulder toward the inside of the bottle. All of the guards face the front of the bottle. Their carved garment is very distinctive and is covered in red painted dots as is their helmets which are oddly carved. The bottom of the garments are scalloped and painted red. They stand at attention with this arms to their side. The cross is painted black and Jesus is nicely carved with curved arms outstretched. His legs are carved so that they are bent at the knees. He is shown with carved and painted facial features. He is depicted with a long black beard and black hair with a crown of thorns. Above his head is a very narrow INRI plaque. Leaning against the back of the cross is a narrow ladder with 14 rungs. 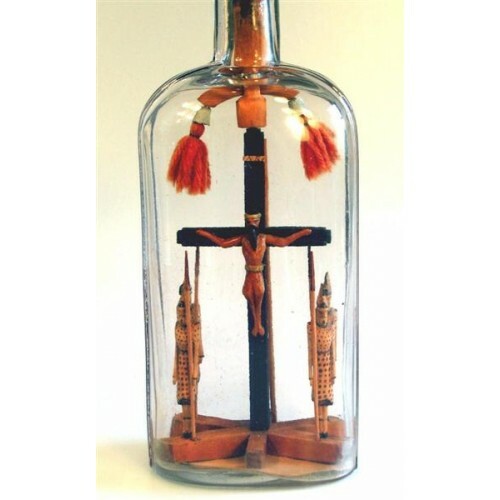 The bottle is sealed with a long wooden shaft that goes to the top of the cross. 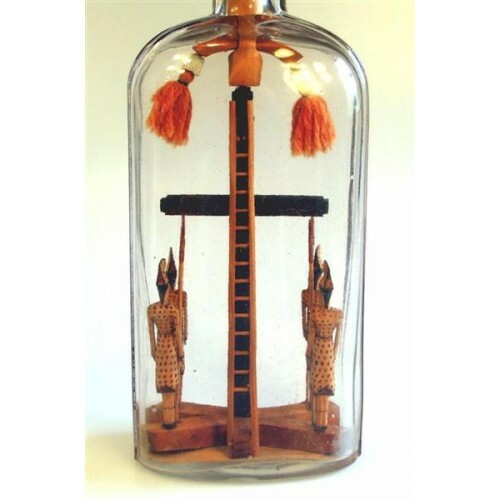 There is a wooden "tamper-proof" piece of wood going through the shaft and hanging from each side of this cross piece are red wool tassels. The top of the shaft comes up from the bottle and then is carved like a Hershey Kiss with the pointy top approximately 1 inch. 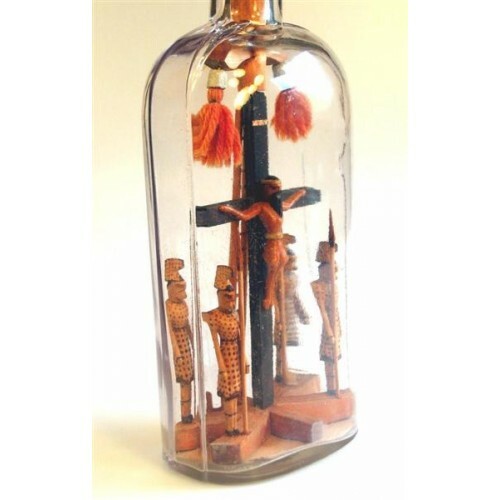 This bottle was made by the same artist is featured in a book called "Genius in a Bottle" on page 133; and also a bottle found at http://sdjones.net/FolkArt/crossegyptian.html. Approx. Bottle Size 7 3/4" x 3 1/4"